← Thanks Be For Dogs! Duane Hanson's sculpture "The Museum Guard" has been temporarily reassigned to a new post in "The Hooper Room" in the Early American Art Galleries of the Nelson-Atkins Museum of Art in Kansas City, Missouri. I was disappointed today when I thought that one of my favorite art pieces was apparently “on vacation.” Duane Hanson’s “Museum Guard” at the Nelson-Atkins Museum is like an old friend, and I wanted to say hello, but he’d been turned out of his old gallery to make room for a temporary exhibition. I laughed when I discovered him in a new location in an Early American room. Good for him! We all need a little shake-up in our routines and locales. Why is that museum guard standing in The Hooper Room? Duane Hanson’s realist sculpture, Museum Guard, has stood faithfully at his post in Gallery L3 since the Bloch Building opened in 2007. Now that two of the contemporary galleries have been emptied to make room for the exhibition “To Make a World: George Ault and 1940s America,” he requested assignment elsewhere in the museum. Before moving to the new Bloch building, “Museum Guard” was stationed very near to his current temporary location in the main building, which was once home to the museum’s contemporary collection before undergoing remodeling to become the Early American Art gallery. Duane Hanson, an American artist, was born in 1925 and died in 1996. He created “Museum Guard” in 1975 out of polyester, fiberglass, oil and vinyl. To read more about Hanson click on Duane Hanson. Some of Hanson’s realist sculptures can be seen at The Saatchi Gallery. Duane Hanson's "Museum Guard" in his usual spot in the Bloch Building of the Nelson-Atkins Museum of Art in Kansas City, Missouri. 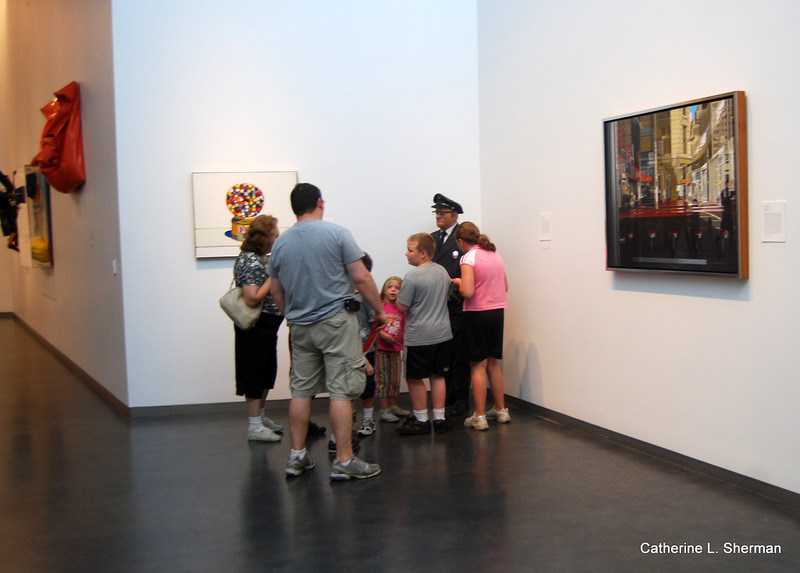 Life imitates art as a real museum guard stands to the right. People can't resist getting their photos taken next to the vinyl Museum Guard. I hope Museum Guard will eventually return here, but now that he's had a taste of freedom, he may be hard to track down. 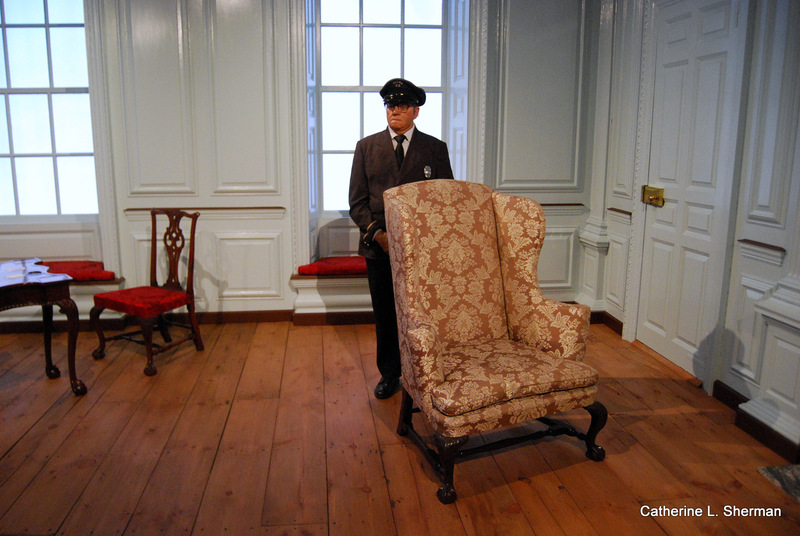 Duane Hanson's "Museum Guard" is one of the most popular art pieces in the museum. He always draws a crowd. 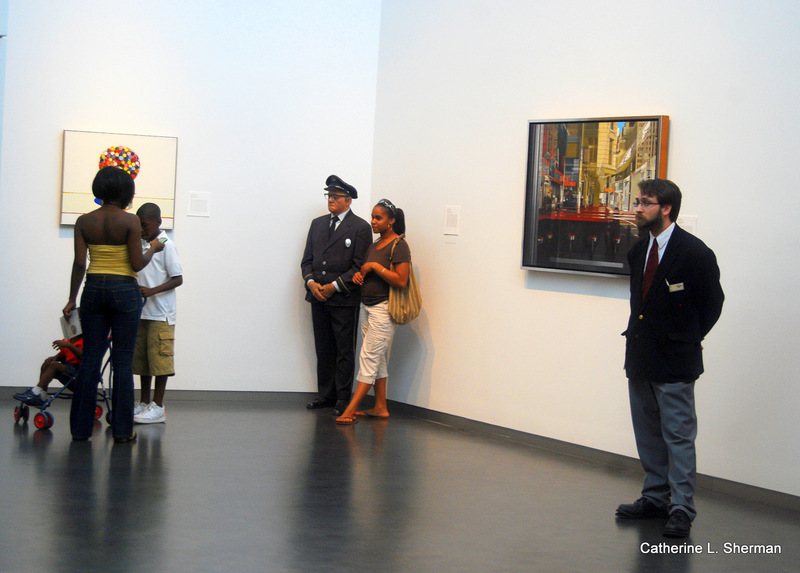 Sign explaining Duane Hanson's "Museum Guard's" new assignment. 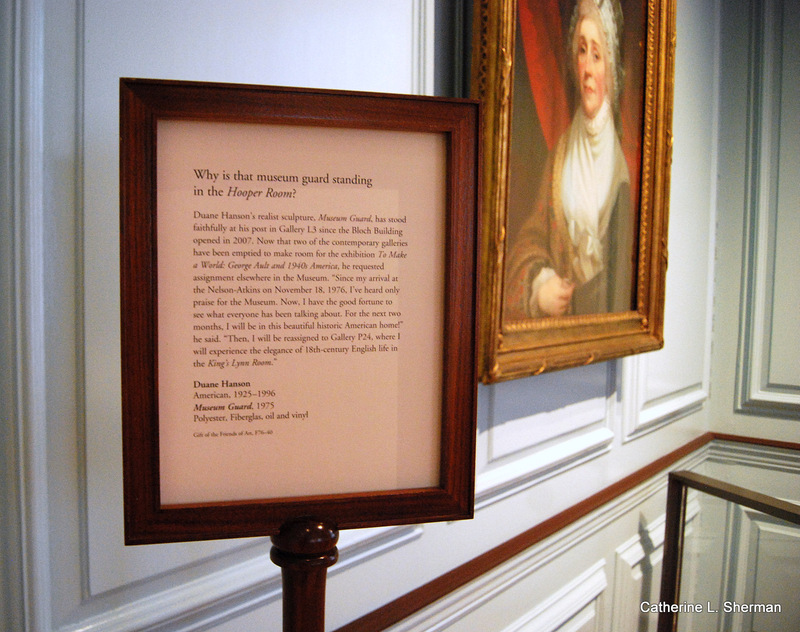 The museum has a little fun and a temporary exhibition gets to exist for a while. Sounds like an artful win-win to me! It’s that guy in the corner. He’s so lifelike that you do a double take. He has all of the personality of your typical museum guard as well. This is funny! Kind of reminds me of when they move things around in the grocery store just to get us to venture out of our normal paths and go explore and find new things. We’re all resistant to change but it is better for us than we know! Sound like something I would love to experience…if only I could travel outside my little box more~enjoyed the post! What an interesting museum piece! Full of humor too. I’m amused to see that you’re so familiar with this Museum like you know where everything is displayed. Also may I take this opportunity to wish you and yours a very Merry Christmas and enjoy wonderful time with family and friends. I’m with Arti. This is such fun and especially since you know it so well. I hope you have superb holidays and that next time you find him in even another location. Roy’s been at the museum for much longer than 2007. Prior to the Bloch Building, he was in the modern art floor (which I think was the second floor) for years. I remember a school trip (like, 1990 or so) where I watched one of my teachers ask him for directions. She didn’t know he wasn’t human. I imagine he’s been returned to his original post now.